HYPER-METALLIC FINISH. ENDLESS WAYS TO GLOW. Weightless, longwear cream-powder hybrid highlighter duos with a hyper-metallic finish, born in a colorful range of rule-defying shades designed to make all skin tones pop. Just when you thought Killawatt couldn't get any better. Killawatt Foil Freestyle Highlighter Duo enters the highlight game with the same creamy texture of the original in a new, mega-reflective, foil-like finish. With intense metallic edge, these buildable, color-rich luminizers come in rule-defying shades that look equally killer on all skin tones. When it comes to choosing a shade, there's no wrong answer. Take a cue from Rihanna's personal highlighting technique and rev up your glow with vibrant pops of chrome color. Rihanna's no-limit approach to highlighting is all about layering Killawatt Foil to create colorful dimension from cheeks to eyes to temples - blurring the line where your highlight begins and eyeshadow ends. Like the bestselling Killawatt you know and love, Killawatt Foil keeps skin lit beyond sundown with its weightless longwear formular - a cream-powder hybrid that instantly melts into skin and blends with almost zero effort. Another win: it's loaded with extra fine, ultra-smooth shimmer to make all your hyper-metallic gleams come true. 7DAYWKND: MICA, DIMETHICONE, POLYGLYCERYL-2 TRIISOSTEARATE, SYNTHETIC FLUORPHLOGOPITE, TRIETHYLHEXANOIN, ISODODECANE, POLYETHYLENE, MAGNESIUM MYRISTATE, PHENOXYETHANOL, SILICA, TRIMETHYLSILOXYSILICATE, TIN OXIDE, AQUA/WATER/EAU, ALUMINUM POWDER (CI 77000), TITANIUM DIOXIDE (CI 77891), BISMUTH OXYCHLORIDE (CI 77163), CARMINE (CI 74570), IRON OXIDES (CI 77499, CI 77491). POOLSIDE: MICA, DIMETHICONE, ISODODECANE, POLYGLYCERYL-2 TRIISOSTEARATE, TRIETHYLHEXANOIN, POLYETHYLENE, MAGNESIUM MYRISTATE, PHENOXYETHANOL, TRIMETHYLSILOXYSILICATE, AQUA/WATER/EAU, TITANIUM DIOXIDE (CI 77891), BISMUTH OXYCHLORIDE (CI 77163), CARMINE (CI 74570), FERRIC FERROCYANIDE (CI 77510). MIMOSA SUNRISE: MICA, DIMETHICONE, ISODODECANE, POLYGLYCERYL-2 TRIISOSTEARATE, TRIETHYLHEXANOIN, POLYETHYLENE, MAGNESIUM MYRISTATE, PHENOXYETHANOL, TRIMETHYLSILOXYSILICATE, TITANIUM DIOXIDE (CI 77891), YELLOW 5 LAKE (CI 19140), BISMUTH OXYCHLORIDE (CI 77163), CARMINE (CI 75470). SANGRIA SUNSET: DIMETHICONE, SYNTHETIC FLUORPHLOGOPITE, MICA, ISODODECANE, POLYGLYCERYL-2 TRIISOSTEARATE, TRIETHYLHEXANOIN, POLYETHYLENE, SILICA, MAGNESIUM MYRISTATE, PHENOXYETHANOL, TRIMETHYLSILOXYSILICATE, AQUA/WATER/EAU, TIN OXIDE, TITANIUM DIOXIDE (CI 77891), BISMUTH OXYCHLORIDE (CI 77163), CARMINE (CI 74570). SAND CASTLE: DIMETHICONE, SYNTHETIC FLUORPHLOGOPITE, MICA, ISODODECANE, POLYGLYCERYL-2 TRIISOSTEARATE, TRIETHYLHEXANOIN, POLYETHYLENE, MAGNESIUM MYRISTATE, PHENOXYETHANOL, SILICA, TRIMETHYLSILOXYSILICATE, AQUA/WATER/EAU, ALUMINUM POWDER (CI 77000), TITANIUM DIOXIDE (CI 77891), BISMUTH OXYCHLORIDE (CI 77163), IRON OXIDES (CI 77491), CARMINE (CI 75470). MINT'D MOJITO: MICA, DIMETHICONE, SILICA, ISODODECANE, POLYGLYCERYL-2 TRIISOSTEARATE, TRIETHYLHEXANOIN, POLYETHYLENE, MAGNESIUM MYRISTATE, PHENOXYETHANOL, TIN OXIDE, TRIMETHYLSILOXYSILICATE, AQUA/WATER/EAU, ALUMINUM POWDER (CI 77000), TITANIUM DIOXIDE (CI 77891), BISMUTH OXYCHLORIDE (CI 77163). PENNY4UTHOTS: MICA, DIMETHICONE, SYNTHETIC FLUORPHLOGOPITE, POLYGLYCERYL-2 TRIISOSTEARATE, ISODODECANE, TRIETHYLHEXANOIN, POLYETHYLENE, MAGNESIUM MYRISTATE, CAPRYLYL GLYCOL, PHENOXYETHANOL, BISMUTH OXYCHLORIDE (CI 77163), IRON OXIDES (CI 77499, CI 77491, CI 77492), TITANIUM DIOXIDE (CI 77891). “Sangria Sunset” look familiar? 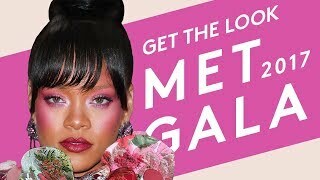 Rihanna debuted the magenta shade at the 2017 Met Gala. For the second step of the Fenty Face, layer that highlight! Killawatt Foil is the perfect way to spice up your daily with a touch of color. 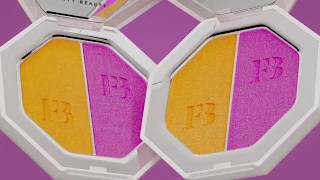 Apply as highlighter, blush, or eyeshadow - it's called Freestyle Highlighter for a reason! Rihanna's way: Sweep Killawatt Foil across tops of cheeks, from brow bone to temple, then up from temple to above the brow arch. Use the Cheek-Hugging Highlight Brush 120 to apply onto cheekbones. Thanks to the brush's asymmetrical shark-tooth shape, you can highlight with more edge and precision. Use the fatter side to supercharge cheeks, the leaner side to luminize your nose and chin, and the precision tip to brighten eyes and your cupid's bow. Apply along the lashline to make eyes pop.